We absolutely love this Papa Bear chair designed in 1951 by Danish designer Hans Wegner and seen at our latest Midcentury show at Lord’s Cricket Ground. It got its name after a critic said it looked like a giant teddy bear coming to wrap its arms around you and achieved global fame in the Sixties thanks to the American series Bewitched. Fans of Wegner, the father of Danish chair design, may have spotted it in the living room in Samantha and Darren’s house in archive footage. But did you know there’s an even rarer Mama Bear too? And we think we might just love it that little bit more. 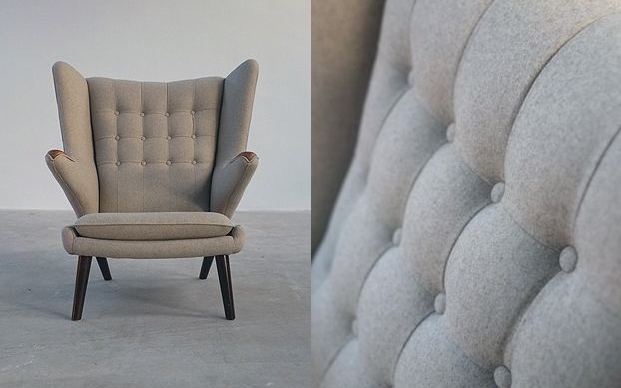 It has not yet been reproduced which makes it all the more rare (back in your box Vitra and Fritz Hansen) and it has not only the comfort but the finesse a lady chair deserves. Check it out here. Wegner was a master at creating highly practical pieces that would go on to endure and fetch unfeasibly high prices like the ox, the papa and his wishbone chairs. “I have always wanted to make unexceptional things of an exceptionally high quality…” he said. Well he got the second bit right.